This risotto was actually really good. I used store bought shrimp stock but fortified it with some shrimp shells. The general ratio of rice to liquid for risotto is 1 to 3 but you should adjust it accordingly. 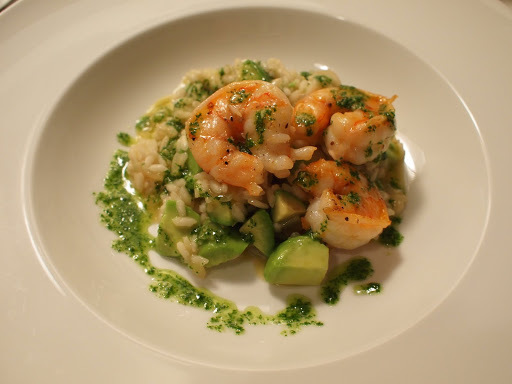 As the risotto was nearly done I seared the shrimp (cook all the way). I folded the avocado into the finished risotto. The cilantro oil is simply cilantro and olive oil blended together (you can add garlic if you want). When plating, top with the seared shrimp and cilantro oil.